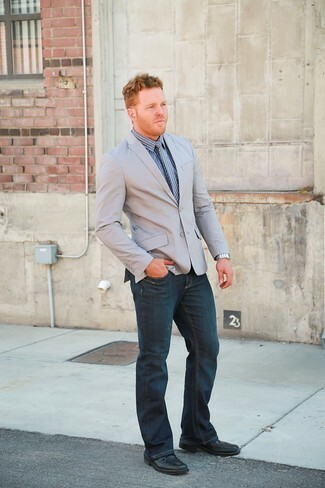 Who said you can't make a stylish statement with a relaxed casual outfit? 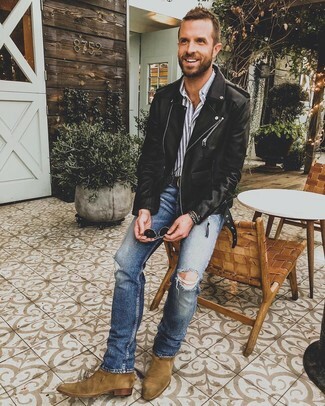 Make heads turn in a Brooks Brothers Non Iron Milano Fit Tonal Stripe Dress Shirt from Brooks Brothers and blue ripped skinny jeans. For something more on the elegant end to finish off your getup, round off with a pair of brown suede chelsea boots. 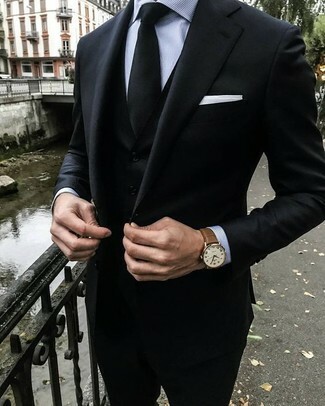 This outfit proves that it is totally worth investing in such elegant menswear items as a grey vertical striped dress shirt and a black three piece suit. 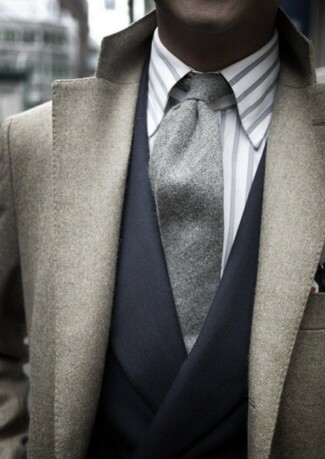 This classy pairing of a grey vertical striped dress shirt and a grey overcoat is undoubtedly a statement-maker. 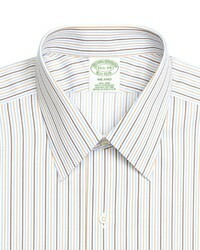 Team a grey vertical striped dress shirt with white chinos for a dapper outfit. A grey vertical striped dress shirt and dark purple corduroy dress pants are absolute must-haves if you're planning a smart closet that holds to the highest sartorial standards. 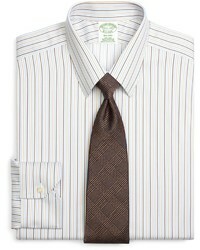 For sophisticated style with a twist, wear a grey vertical striped dress shirt with a navy wool suit. 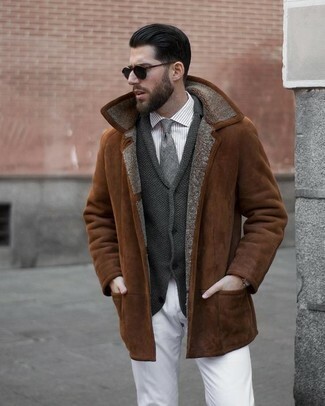 Why not take a more laid-back approach with footwear and add a pair of dark brown leather casual boots to the equation? 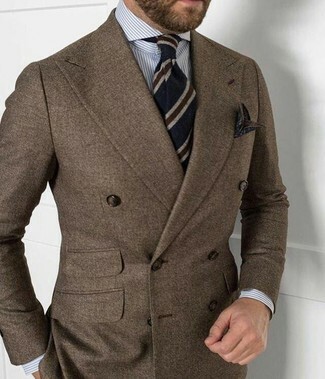 Loving how this combo of a Brooks Brothers grey vertical striped dress shirt and a brown wool double breasted blazer instantly makes any man look refined and stylish. Combining a Brooks Brothers grey vertical striped dress shirt and navy jeans is a fail-safe way to infuse masculine sophistication into your day-to-day styling rotation. Spice up this outfit with a more sophisticated kind of footwear, like these black leather loafers. 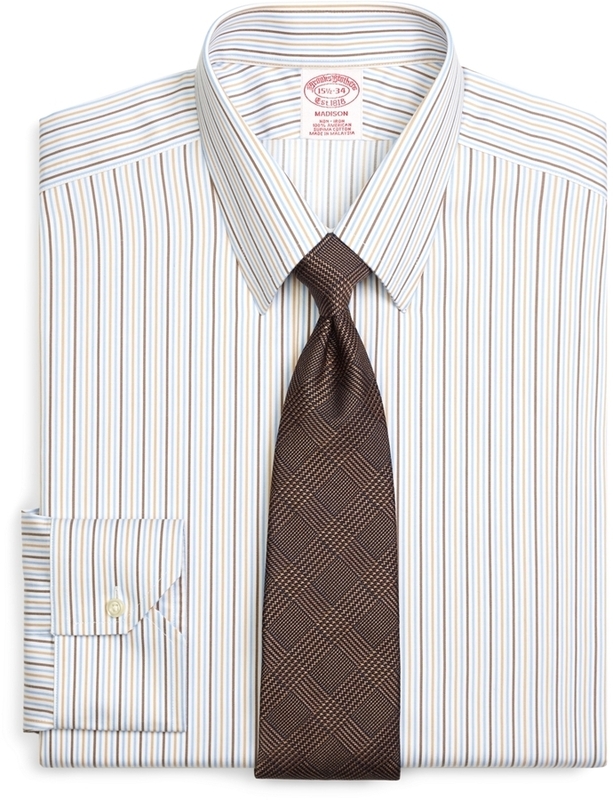 Putting together a Brooks Brothers grey vertical striped dress shirt and a charcoal vertical striped suit is a guaranteed way to infuse your styling rotation with some manly elegance.